This helmet let me wear the glasses without having them steamed. The interior is plush and very well crafted. My head size is 57cm and the medium size is perfect. Yes, the price is high but you get what you pay for. Simply fantastic. Fantastic quality l cant wait to use it. Bought to replace my black X3, love it, great colours and lighter. Great fit. It's a question everyone will ask. I took the plunge after mid range AGV's for many years. I have now tested the helmet in all weathers, fog, frost and gale force winds, the joys of riding all year round to work! Firstly, do not be put off by those who had trouble with the pinlock, it's a nonsense to say it's hard. Watch the videos on pinlock site, you can adjust the little screw on the visor to get a perfect fit and it's doddle to fit, just copy what they show you, there is a technique! The helmet itself fits perfectly and I had not tried one before ordering. There is no buffering or head wrench from the peak even at high speed, the visibility gains are a must in traffic, the visor area seems much bigger than my AGV's. Arai's are sometime heavy but this is just fine, no noticeable difference. So to sum up, visibility excellent, Pinlock works perfectly even on a foggy morning, ensure all the vents are open though to get the best from it, weight is good and the vanity to finish, it looks the business! Yea, it cost a packet but in my opinion, well worth it! I had a tour-x3 before that, so I stood at proven values. The best helmet. Supremely comfortable and looks great. It is also a quiet helmet with excellent vision. 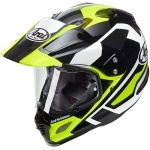 It´s my first Arai and I´m deeply impressed. It´s very well engineered with a superb quality and elaborated to the tiniest peace of foam. Excellent. 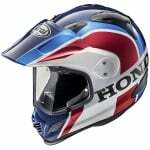 Arai once again excels itself with the production of this helmet. Well engineered, with superb quality this helmet is probably the best I've ever owned. The peaked visor helps with easing that perpetual winter sun from causing you to squint or stop to put on sunglasses. At first compared to other Arai helmets I've owned it's a little on the snug side, however this is easily fixed by the clever padding system which allows you to remove padding around the face section in 5mm intervals! Brilliant! I've been using this helm with great pleasure. The quality and feel of this helmet is absolutely amazing. At the moment of opening the box I did notice the mudshield was slightly bent, but was easily fixed by bending it back (it's quite flexible). Just hoping that they will make replacement mudshields in the same color pattern. The only downside I had with this helmet is that the visor is distorting lights when riding with it in the dark. It also doesn't go really well with glasses, the reflections in the visor make lights look blurry somehow. I cleaned thoroughly but with no effect. Would require a different visor that's not reflective or distorting lights. Not sure if anyone else has had this problem, but for me it basically makes me only wear the helmet during daytime, not what I expected from a helmet at this price (maybe it's the curvature of the visor in combination with glasses?). FYI I do not have this issue using the same glasses on any other helmets, I've used (Shark / Shoei). Just the best, had an AGV that became faulty within months, swapped and paid the difference. Worth every penny!!! 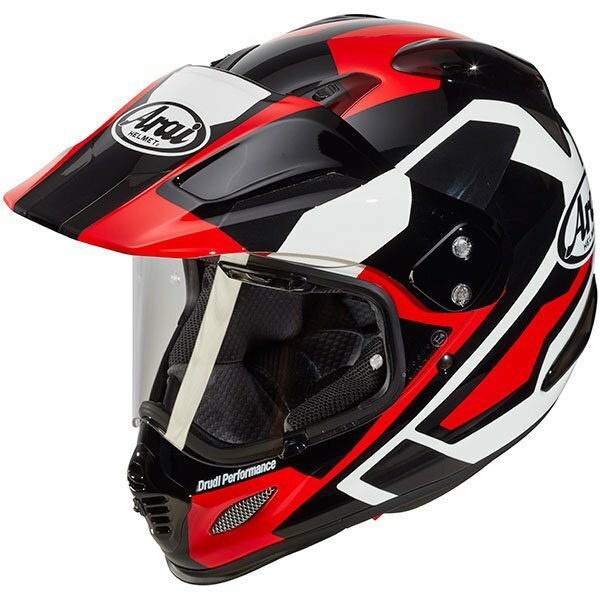 If you're reading reviews & checking prices on this helmet you're probably asking yourself (as I was) can I justify paying sooo much for a helmet. In a word, yes. The first thing is the fit. Watch the Arai videos, measure your head and trust them to make the helmet size you need rather than guess. For me the fit is so close there is no movement if I shake my head but it's so comfortable straight out of the box. Visibility is amazing. It's got a big opening but the width is fantastic for your peripheral vision especially on life savers! One concern I had was the Pinlock. Lots of reviews saying it's hard to fit due to the visor shape. It is, but check out the instruction videos, set the pins to the widest setting, wear rubber gloves to prevent finger prints and don't be afraid to stretch the visor as shown in the video. My Pinlock touches in the centre but this doesn't affect the visibility. First commute in the rain and I can honestly say there was zero fogging, even better than my Evo 1 with the chin bar up! I ride 365 so this helmet will not last forever, if you only ride occasionally it may be a bit of a luxury, but if you can afford it buy it, you won't be disappointed. Nice helmet and should be for the price. Visor fit is excellent, chin vent is very good easy to open and close even with gloves on. This is a top quality helmet from Arai as usual. There are plenty of vents that can be closed and opened at will. Advice on Pinlock installation; watch those finger prints when installing. Installing the Pinlock is a must in my opinion, without it it does get a bit steamed up on the lower part of the visor. I found installing it was a bit tricky, so be patient. Great looking lid from Arai - all the quality and a perfect fit - great service as usual from Sportsbikeshop. This Arai Tour X4 helmet has exceeded my expectations of this top quality helmet. Great fit with more than enough vents to keep the visor mist free. Great vision and not to heavy. 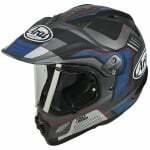 Would highly recommend to anyone thinking of buying an adventure or duel sport helmet. It's my fourth Arai so I'm happy about quality and comfort, however the Pinlock insert seemed impossible to fit correctly. This is my first Arai helmet and it won't be my last, this is in my opinion a expensive helmet but as the old saying goes you get what you pay for. The build is top quality and the most comfortable helmet I've ever owned. Extremely comfy, worth the money. Brought this helmet off the star ratings on the site review, and it sure is 5 star.